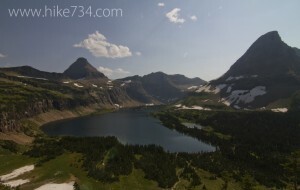 The crown jewel of Going-to-the-Sun Road is Logan Pass, and this is where the Hidden Lake Trail starts. The entire hike features panoramic views across alpine meadows and rugged peaks. Snow lingers well into July, but the flowers stick around until September (they peak in August). The trail is briefly asphalt and turns into a boardwalk. The boardwalk steps upward to the moraine from the glacier that used to be at the base of Clements Mountain. From there it is a dirt trail going over Hidden Pass where mountain goat sightings are frequent. Hidden Lake comes into view soon after an overlook and an interpretive sign, as well as a view into the Sperry Glacier basin. Most visitors head back at this point, but the trail does continue an additional 1.2 miles down to the lake, although that leg of the trail is extremely steep. Trailhead: Located directly behind the Logan Pass Visitor Center.